Choose from a variety of tour types and destinations! Travel with us around the country touring in our modern deluxe fleet of Prevost motorcoaches! Travel by jet to exciting vacation locations across the United States and Canada! Travel to a variety of locations around the world! From football to baseball to horse racing, we have a variety of tours for the sports fanatic! Take advantage of special promotions to get discounts off of our more popular tours! We offer 52- to 56-passenger motorcoaches and 24-passenger mini-coaches available for your group travel needs. Do you have a church, civic group, friends or family group wanting to travel? CLICK HERE to learn how we can create a custom tour specifically tailored for your group. 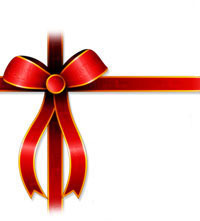 Christian Tours Gift Certificates are available in any amount. They're always in style, and they're sure to fit. 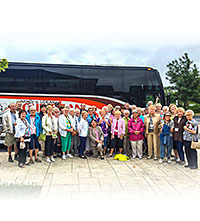 Christian Tours has been operating escorted motorcoach tours for over 40 years. We are conveniently located in North Carolina near major cities such as Charlotte, Winston Salem, and Greensboro and just a short distance to South Carolina. Our escorted tours are fun-filled, family friendly vacations. It is easy to join us. We travel to sights all across the United States and Canada. We also offer International & Domestic Fly tours including scenic and exciting destinations. 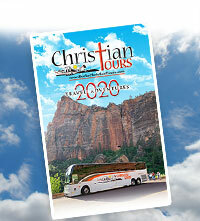 At Christian Tours, the safety and comfort of our passengers is priority! Our modern deluxe fleet of Prevost motorcoaches goes through a rigorous maintenance program at our top-notch facilities. 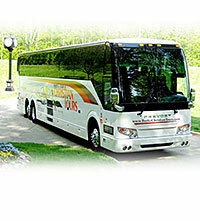 When your group needs to charter a motorcoach or mini-bus we will provide a competitive quote. You may ask “What is Christian Tours?” First we are Christian people providing opportunities for people to travel with other Christians. We provide a devotion on the coach each morning as we travel and operate our tours in a manner that you would feel comfortable traveling with your parents or children. Our Christian faith is important to us and we consider it an honor to offer group travel to people with like minded values.